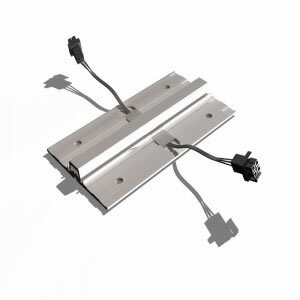 Provides a concealed and vandal resistant method of transferring cable. Intastop’s Electrical Transfer Hinge provides a concealed and vandal resistant method of transferring cable. Performance tested to 1.25 million cycles; it has a removable option, where the hinge is designed to be installed in 2 or 3 sections allowing the current carrying cable to be serviced or replaced without removing the door from the frame. Ideal for use in applications such as automatic disabled access or Intastop’s Door Top Alarm. Suitable for single and double acting doorsets. 4 wire (as standard), 8 or 12 wire available. Transfer wire tested to 3 million cycles with a 5 year warranty*. 200mm section hinge as standard. Performance tested to 1.25 million cycles. Safe and secure power supply through hanging stile of the door. Allows power for multiple systems; access control, door automation, smart glass applications, etc. Easy to maintain as fully accessible without having to take the door off. Reduces maintenance and life cycle costs. *Subject to Intastop’s warranty policy. Extreme Duty for Doors up to 500kg in weight. *Subject to Intastop's warranty policy.